Hash yer dothrae chek? Oh, I’m sorry, fellow equine enthusiast hanging out at this stable. I thought you might speak Dothraki. No fear, you’ll soon be able to learn all the phrases you need to pick up fellow horse lovers at the stable or tell your boss she reminds you of an enraged wild boar. When George R.R. Martin created the Dothraki language for his Game of Thrones series of books, he didn’t build an entire vocabulary or grammar, but he did a good enough job that a linguist has expanded it to an actual language, reports CNET. Language consultant David Peterson introduced a new Living Language course at San Diego Comic Con this week, a course based on the series that offers grammar lessons, pronunciation guides, vocabulary, and cultural notes that tell you exactly when and where you should use certain words. 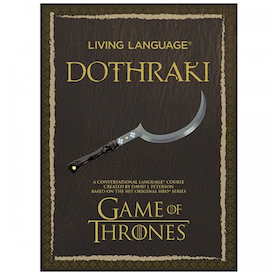 “Living Language Dothraki” will sell for $19.99 starting on Oct. 7, with 200 words and phrase included. For an additional $10 you can buy an expanded online course, or a mobile app for an additional $3.99. “I always like Dothraki because it’s non-European,” Peterson said, noting that its roots in mostly Arabic and Spanish really makes it roll off the tongue, especially with those trilling Rs. “It’s great for picking people up,” he joked. This is the first language he’s invented that was based entirely on someone else’s work — Martin started the process and Peterson says he’s kept the author’s structure. “George R.R. Martin did an incredible job for someone who says he’s not a language guy,” he explains. Beyond saying “how are you” to the hottie with the horse, which literally translates to “you ride well” — the best compliment a Dothraki could give — you can learn to call your annoying neighbor an “ifak” which means, “one who walks.” BURN! Thanks, Dothraki!